Mortgage and loan software includes the powerful Amortization Schedules Plus! feature that allows you to override, skip or add any number of payments. The Loan Management feature allows you to track actual loan terms and varying interest rates, as well as your actual payments made and projected payments. The Loan Manager also allows you to assess late fees and charges and track insurance, taxes, etc. Includes 14 different Day Count Conventions including 30/360 and Actual/Actual, plus many different Payment Types including Normal, Continually Adjusting Payments, Fixed Principal plus Interest and Interest Only. Also includes dozens of powerful calculators as well as many reports including annual summaries. Data file backup, integrated calculator. 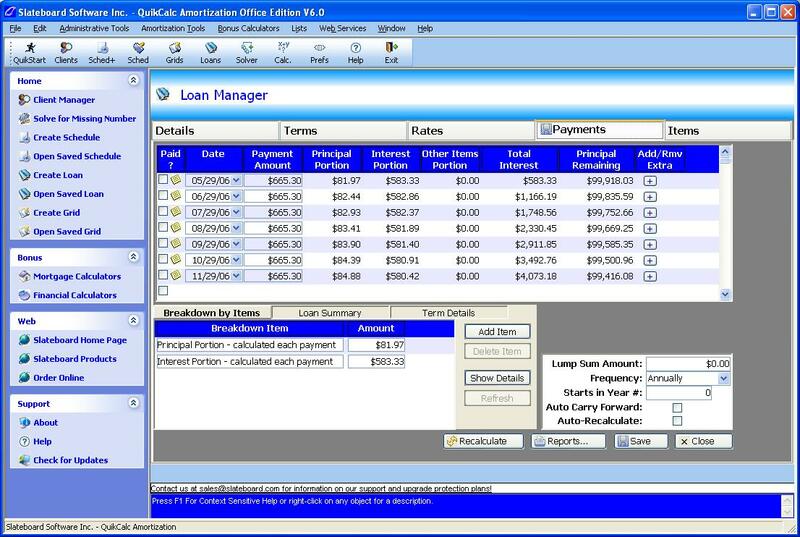 Also available in two additional versions, QuikCalc Lite Edition, that includes everything except the Loan Manager, and QuikCalc Amortization, that includes the amortization tables and schedules.